Rasta Slots is that perfect casino slots game for those who enjoy the Rasta lifestyle. This application has awesome reggae music and that classic Jamaican feeling. The best part of this appkication may not even be its main function, which is slots. I would have to say the music is really what makes it an awesome app. As you play the classic slots, which is fun and all you get to listen to some great Reggae music and there are tons of other music packs that you can purchase via an in-app purchase. What great about this is that you can get a buch of great songs for cheap and you can preview them before you buy. 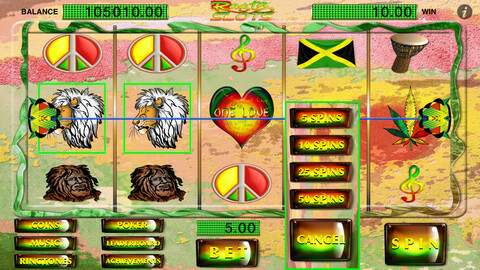 The music packs can be downloaded to use as the background music for when your playing Rasta Slots. Once you have won enough coins, or purchased coins through the in-app purchase you can also play Poker. The Poker game is double or nothing and the minimum buy-in fee is $6,000 and you can quickly double your coins to play more slots. The objective of the Poker game is to with 3 games before the dealer. Rasta Slots is currently a FREE application in the Apple App Store. It does not have any ads and you get 1000 free coins to start with daily free bonus coins. Go check it out today. You will love the music if your a Rasta fan. What an awesome app! I have purchased all the music track packs as cannot put this one down. A wonderful game and the reggae music from top recording artists is second to none. And the best part is its free!! !